Congregation Shaarei Tefilah Lubavitch invites you to become a member of our wonderful shul! 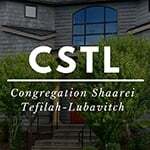 CSTL is a warm, vibrant, and loving community, known for our spirited davening, love of Israel and a great Kiddush. Seize the opportunity to support and grow our wonderful community.